Our Peak & Canyon Tour takes you to the mild rainforest of Vancouver’s North Shore. This is your best option for a chance to get into the stunning nature that surrounds the city. Stops include Capilano Suspension Bridge Park and Grouse Mountain Resort. At Capilano Suspension Bride Park, cross the famous suspension bridge spanning a heart-pounding 137 metres (450 feet) across and 73 metres (230 feet) above Capilano River. Make sure to allow time to visit the Treetops Adventure and Cliffwalk as well at the Capilano Suspension Bridge Park. 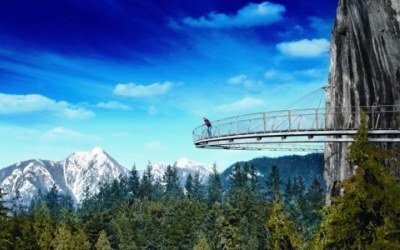 Subject to the timing of the day, you will visit Grouse Mountain before or after your visit to the Capilano Suspension Bridge Park. Rising 1,250 metres (4,100 feet) above Vancouver, Grouse Mountain offers stunning city views and an array of activities. Explore the Refuge of Endangered Wildlife, home to two Grizzly Bears, Grinder and Coola. There is plenty to explore at this resort, along with several dining options and Theatre in the Sky, showing local films. This tour makes for a great pre-cruise tour. 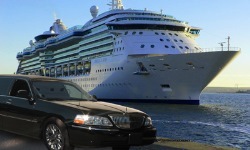 We can pick you up and transfer your luggage to the cruise ship while you are on tour (no extra charge). Our tours are handled on comfortable mini-coaches seating up to 30 guests and offering great views. They are detailed after every tour and are outfitted with heating & air-conditioning for your comfort. Live tour commentary is conducted in English by our friendly, highly trained and award-winning Tour Guides. Hotel specific pick-up times are provided when reservations are confirmed. You begin with a slow drive over The Lion’s Gate Bridge spanning the entrance to Vancouver’s port. This was the longest suspension bridge in the world when it was completed in 1938, and it offers unparalleled views of the harbour, downtown Vancouver and beyond. The Capilano Suspension Bridge – Vancouver’s very first tourist experience. Walk among the towering trees of this temperate rainforest and learn the ways of the local First Nations’ Peoples. Then walk across one of the world’s longest foot suspension bridges to the other side of the river where you can climb to the canopy and stroll through the “Treetops Adventure”walkway high above the canyon floor and the river below. If you are feeling adventurous, try the “Cliffwalk”; this heart-stopping cliffside journey takes you through rainforest vegetation on a series of unobtrusive cantilevered and suspended walkways jutting out from the granite cliff face above Capilano River. The Grouse Mountain Skyride – Take the tram 1,200 metres (3,700 feet) to the viewpoint above the city. Be enthralled by the, now grown, orphaned grizzly bears at the Refuge for Endangered Wildlife. Get up close and personal with these amazing creatures with only a thin wire fence and a couple of metres between you and them. Did we mention the view? After all, you are on top of a mountain and on a clear day you can see Mount Baker, a volcano in the United States, and Vancouver Island 50km (30 miles) off the coast. Grouse Mountain offers casual to fine dining and cocktails atop the peak in the Chalet adjacent the tram building. This is truly a great place to create lasting memories for you and your loved ones. 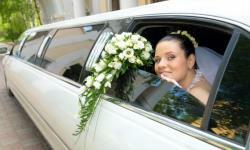 Complimentary Hotel Pick-up - Pick-up from your downtown Vancouver or Richmond hotel. Luggage handling included. Grouse Mountain Resort - Escape into the vast mountain playground at 1250 m (4100 ft) (admission included). Refuge for Endangered Wildlife - Grizzly Bear habitat atop Grouse Mountain. Capilano Suspension Bridge Park - Cross this legendary attraction at 70 m (230 ft) high and 137 m (450 ft) long (admission included). Cliffwalk - 213 m (700 ft) cantilevered walkway 30 storeys high. Lions Gate Bridge - A younger iconic suspension bridge built in 1937. Hotel, Cruise Terminal, Airport or Train Station Drop-off - Downtown Vancouver or Richmond hotels, Cruise Terminal, Vancouver International Airport (YVR), or VIA Rail. Pick-up times are 60 minutes earlier at Richmond (Airport) hotels. Advised Clothing: Dress in layers. Comfortable walking shoes are recommended. Don’t forget the fixings! Depending on the weather look at bringing sunscreen, sunglasses, hat, gloves and waterproof outer layer. Any excess items can be stored on the vehicle while you’re exploring. Accessibility: Moderate mobility is required at each of the tour stops as they include hills, stairs and uneven terrain. There’s a lot to explore. Be prepared to do plenty of walking. Copyright © 2019	Ace Charters Vancouver. All rights reserved.